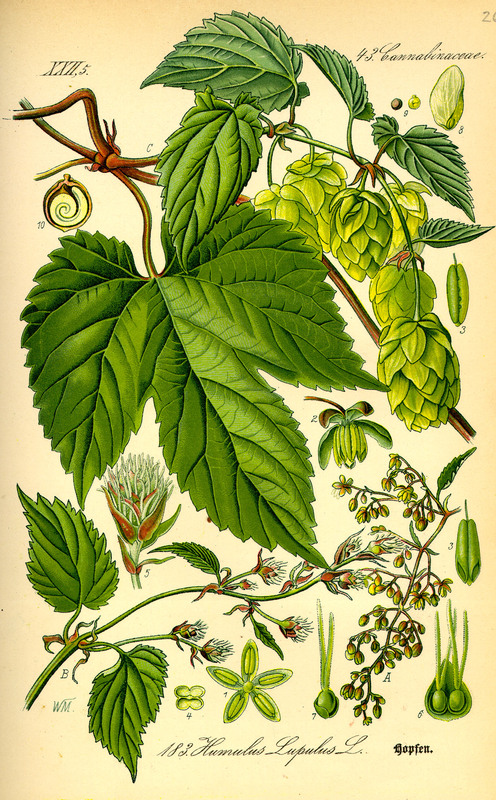 Humulus lupulus is a perennial vine, stems to 10 m long, rough, colonial from rhizomes. Leaves opposite, deeply 3-lobed, tips pointed, base broadly lobed, upper leaves often broadly egg-shaped, lobeless. Flowers small, greenish, dioecious (sexes on different plants), female spikes to 1 cm, becoming as long as 6 cm in fruit, bracts persistent, entire, glandular at base (use lens), male inflorescences 5-15 cm long; blooming July-Aug.
Habitat: Moist soil, edges, open areas. Notes: Long cultivated and escaped. Used in beer making. Host to larvae of the question mark butterfly, Polygonia interrogationis and the comma butterfly, P. comma (Nymphalidae), (Tallamy 2003; Pyle 1981).